Most people think that every dog knows how to play fetch and they will love to do it. However this is not the case, you must teach your dog to play fetch. We automatically think playing fetch it inherent for dogs, but it’s not. Fetch is a game that we, the human, have created. So we need to teach them the rules of our game. Some dogs won’t chase the ball, some will chase it and not return back with it, and others will go get the ball, but then they play “keep away” and not allow you to get the ball back. 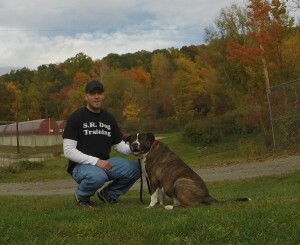 Just like Tug, fetch offers so many positive benefits for you and your dog. Fetch is terrific physical and mental exercise, a great way to practice obedience commands, and a fun way to develop the bond between you and your dog. I start teaching fetch by having the dog on a 20-50+ft long line. NOT a retractable leash or steal cable, and the long line is NOT attached to a stationary object. The dog is dragging the long line around and you can simply pick it up when necessary. You should only play fetch in a securely fenced in area. Step 1: Put dog on long line. Step 2: Throw the ball. Step 3: Once the dog has chased the ball and now has possession of it, I will say “Come”. If he starts returning to you, praise amply. If the dog does not come or runs in a different direction, I will employ the long line to guide him back to me. Some dogs will automatically drop the ball when they return back, but some will not. If your dog does not, there are two possible ways to teach them to “Drop It”. 2: Use treats to teach the dog to “Drop It”. Have a handful of treats and put one up to the dog’s nose. Just before the dog opens its mouth for the treat, say “Drop It”. Give the treat once the ball is released. 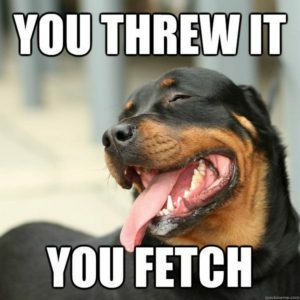 After a dozen or so repetitions, your dog learns that “Drop It” means to release whatever is in their mouth. This is not only a useful command for fetch, but very important for life in general. 1. Fetch is played in a fenced in area and initially taught using a long line. 2. If your dog does not automatically retrieve the ball, tell them “Come”, and utilize the long line to reinforce the recall. 3. Have your dog “Drop It” upon their return. Use one of the above options as a way to teach this command. Once your dog understands the rules of fetch, it will be easier and more enjoyable for you and your dog.